OUTVETS and Boston Pride’s participation in the less exclusive South Boston St. Patrick’s Day Parade, organized by the Allied War Veterans Council, AWVC, is a move towards inclusivity, as reported by most media in and around Boston, Mass. However, little fanfare has been attributed to the organization serving as the probable catalyst for the organizations’ acceptance into the AWVC St. Patrick’s Day parade this year, according to Veterans for Peace, VFP. 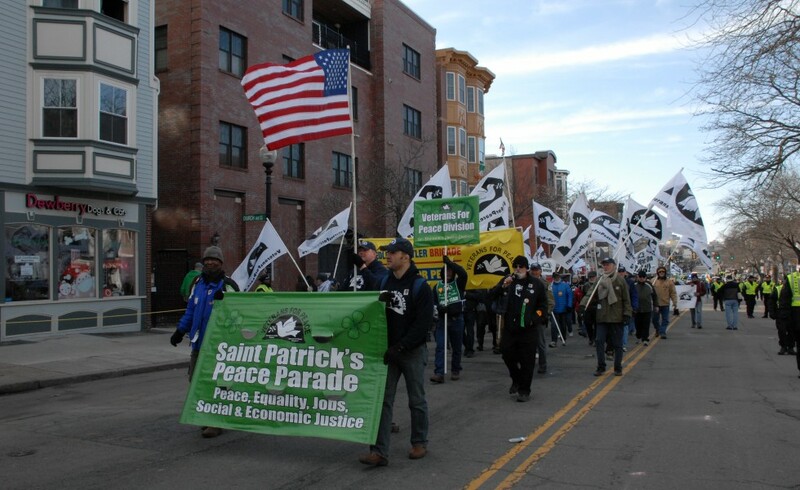 VFP has stood on the front lines, fighting on behalf of the LGBT community and other social and economic justice groups since 2011, when they launched the first St. Patrick’s Peace parade. Serving as an alternative parade for groups that have been purposefully excluded by the AWVC, VFP has given LGBT organizations and others an outlet to openly be visible during a St. Patrick’s Day parade, an option that otherwise would not have been available. Despite the inclusion of OUTVETS and Boston Pride by the AWVC this year, VFP and many other groups are still left behind, denied by the traditional parade organizers, while others who once stood united in solidarity with VFP now have marched ahead without them. And walk is what the LGBT community did alongside other groups dedicated to peace, equality, and social and economic justice, until now. Although VFP is glad of the two LGBT organizations history-making moment, this historical evolution is also poignant. Lara Hoke, US Navy veteran, VFP member and minister of the Unitarian Universalist Congregation, Andover, was surprised by BP’s decision, but understood its historical significance. BP evoked similar sentiments of solidarity to VFP and other groups being left behind from AWVC’s parade too, just a year ago, via an official press release from the organization. However, despite VFP’s denial to be included again in the AWVC parade, BP received their approval letter by mail earlier this week, according to the organization. “While we recognize there is still much work to be done to protect the rights of the LGBT community both here and around the world, and to ensure everyone’s rights to express themselves and to celebrate, we are aware of how symbolically important it is for members of our community to be proudly out among their friends and neighbors as a part of this historic parade,” stated BP’s president, Bruni, through the organization’s official press release announcing why they would march in the parade this year. For other supporters, the inclusion of Boston Pride and its subsequent decision to march is reason to celebrate but evokes other concerns. Mayor Walsh indicated his intentions, via a former press release immediately made available after the first LGBT group, OUTVETS, was approved to march. Allowing only two LGBT groups to participate in Southie’s traditional St. Patrick’s parade may still be too traditional to allow all LGBT, labor, environmental and peace groups to join the event. The Rainbow Times submitted its application to march over a month ago to the AWVC but were not given an answer as to the application status, even after placing numerous calls and e-mails to the organization. “We never received an answer, not even to let us know we were not allowed to participate,” said Nicole Lashomb, The Rainbow Times’ editor-in-chief. In contrast, New York City Mayor Bill de Blasio decided to continue to support equality and did not participate in this year’s Saint Patrick’s Day parade, according to a Care2.com story. “We need something more for it to really feel like we’ve turned the corner. A lot of people feel – I think, rightfully – that that is too small a change to merit a lot of us participating,” Mayor de Blasio said in a recent statement. Wunsch echoed Mayor de Blasio’s sentiments by stating that Boston mayor Walsh should not have marched, just as the NYC Mayor has refused to march in the traditional St. Patrick’s Day parade. “I think this is still a discriminatory parade,” she said. Many media and leaders disagree with Wunsch. Other organizations are hopeful that the inclusion seen this year will mean that more is to come. Scanlon and Wunsch believe a solution to the problem could be for the city of Boston to reclaim its St. Patrick’s Day parade. “The city should take back this parade and make it open and welcoming for all. That is our position,” Scanlon said. “But, this discriminatory and exclusionary practice, especially for vets that have served this country and many of which have given blood for this country, not to be able to walk because, after what we’ve seen and experienced, we are working for peace? It is an insult and they are degrading veterans of the United States military. Efforts to contact the AWVC for this story were in vain. About the St. Patrick’s Day Parade in Boston: The traditional Parade organizer’s, the Allied War Veterans Council, AWVC, emboldened by a 1995 U.S. Supreme Court ruling, had continually denied marching permission for LGBT and peace veterans groups as a matter of First Amendment, free-speech rights. After much controversy and loss of many main supporters last year, the AWVC seems to have had a partial change of heart in 2015 by allowing the two organizations to march in their Parade. *Quotes and excerpts of this story were gathered by Chris Gilmore.